Week 2 of this year’s Reebok CrossFit Open at CrossFit Kalos Sthenos is themed “Sports Teams.” Register on the CrossFit Open website and then join us at 5:30PM on Friday March 1st. 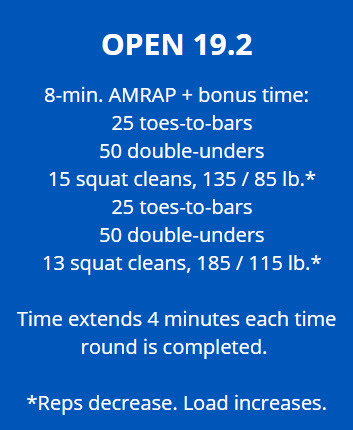 This week’s workout, the second workout of the 2019 Reebok CrossFit Open, features 3 movements. First, athletes will complete a set of 25 toes-to-bar. Next, athletes will complete 50 double-unders. Finally, althletes will complete a set of squat cleans. After each set, the weight will increase and the reps will decrease. For full details on movements, weights, and scaling, visit the CrossFit Open 19.2 page linked below. Coach John’s Advice: This is a fun workout. Its a repeat of 16.2 with more time allotted from the start. Don’t be afraid to scale this one. Substituting knee-raises for toes-to-bar, single-unders for double-unders, or reducing weight on the cleans is a good way to build-up to Rx and allow you to continue with the workout.